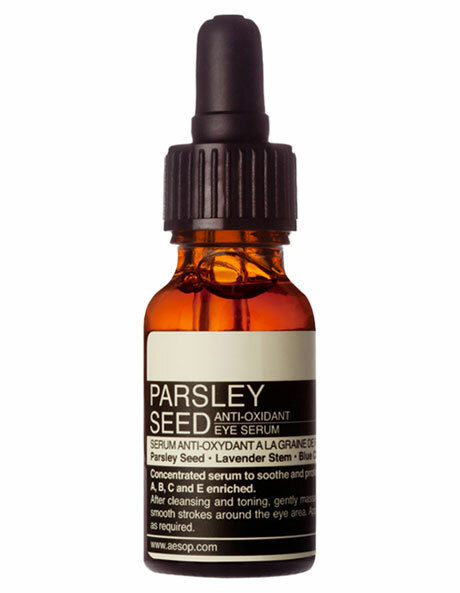 This lightweight Parsley Seed Anti-Oxidant Eye Serum by Aesop fortifies and protects the delicate area around the eyes without greasy residue. Targeted hydration and nourishment comes courtesy of a concentrated blend of fatty acids and botanical oil extracts including antioxidant rich parsley seed. Suited to all skin types. Dispense three drops onto the back of your hand, then use your forefinger to gently dab onto the area surrounding the eyes. Use morning and evening, or as often as desired. Aloe Barbadensis Leaf Juice, Water (Aqua), PEG-60 Almond Glycerides, Hamamelis Virginiana (Witch Hazel) Water, Magnesium Ascorbyl Phosphate, PEG-150 Distearate, Benzyl Alcohol, Glycine Soja (Soybean) Oil, Lavandula Angustifolia (Lavender) Oil, Phenoxyethanol, Sorbitol, Polysorbate 20, Panthenol, Disodium EDTA, Camellia Sinensis Leaf Extract, Ormenis Multicaulis Oil, Benzalkonium Chloride, Chamomilla Recutita (Matricaria) Flower Oil, Methylisothiazolinone, Carum Petroselinum (Parsley) Seed Oil, Daucus Carota Sativa (Carrot) Root Extract, Beta-Carotene, Tocopherol, Linalool, d-Limonene.